I'm thinking about that ring laser thing (from the optical diametric drive research) again where the wave form is formed in such a way that there are always transient negative energy regions in the waveform. What ring laser thing possessing " always transient negative energy regions in the waveform" are you referring to? "Always transient" refers to the way squeezed light makes negative energy. It's always for a tiny fraction of the over all cycle and the positive side always dwarfs it. But in a circular track... there should be a tiny bit present at all times and in all parts of the track. Or maybe not as tiny as it would be in a finite length course and there are two circular stacked circular tracks in those articles. Maybe the two fields can constructively reinforce the negative components or destructively interfere with the positive portion selectively. i don't know much about the physics. I'm just "using the force." EDIT: So here is a question I have about squeezed light. what would happen if a portion of the circular track was made to slow light down? I have read about certain research slowing light down under the SOL in a vacuum. You have two rings... one of the trackways could have unimpeded squeezed light and the other had at least a portion with a go slow zone. Could the tracks be juxtaposed in such a way that the negative regions of the waveform were close enough to sum together? And could there be a tidal pile up of negative energy caused by the go slow zone? Thank you for providing the links and refreshing my mind. (Hat tip to @NoSoSureOfIt for first pointing this out ), a truncated cone EM Drive really is roughly analogous to 1/2 of this "optical diametric drive". Speaking of establishing phenomena - does anyone have a good reference on how using an oscillating EM field is supposed to induce spacetime contractions? Is it just to push the peak past the 1/f noise? There is really nothing here. I have worked with much more precise interferometers and know that laser fringes are inherently noisy. Any thermal gradiant, vibration, or EM energy pulses will show up as a phase shift. That is one of the biggest problems in achieving high resolution spectroscopy with FTIR. Those interferometers are built to a much higher precision than the White Juday experiment and with accurate mirror alignment a narrow band monochromatic interference pattern will cover half the optical aperture. This is what is shown in the diagram from White's paper, reproduced below. (first image) The 3-D plot is just a 3-D rendering of an interference pattern. The Z-scale has made up numbers and no dimension. In actual fact the difference in path length indicated by this interference pattern is 633/4 nM and is just what normal interference patterns look like. 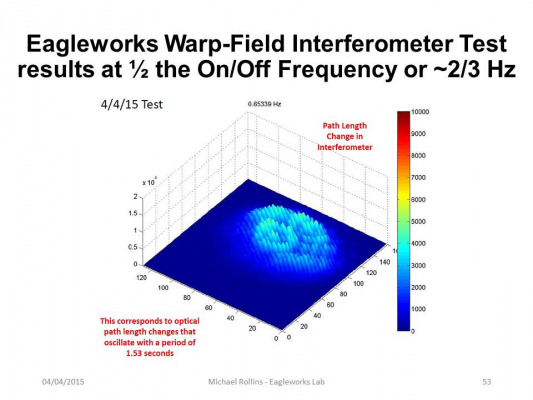 Applying a 3-D toolkit to an interference pattern image does not prove there is a warp field. It is just a flashy powerpoint slide. What is the latest news on the EM drive. I have looked on Google. 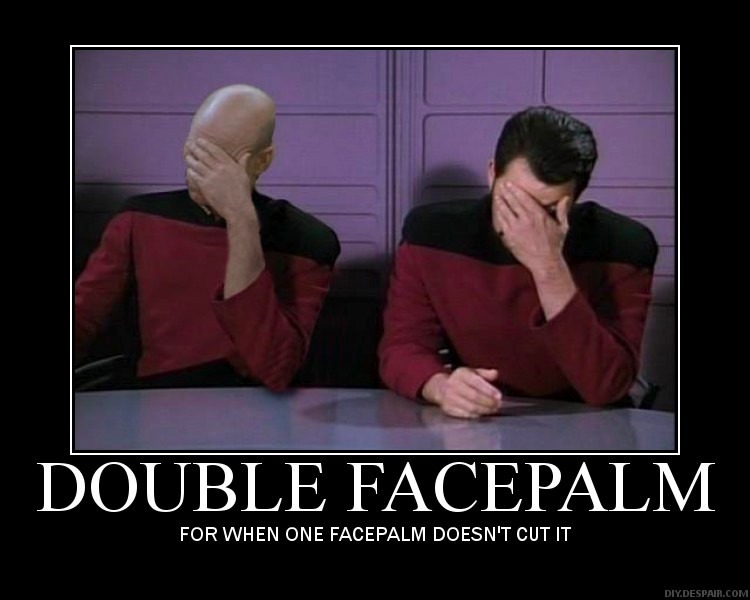 I have just read on another website that NASA may have accidentally created a warp field? Is this true. There is insufficient evidence to support the idea that it might be a warp in spacetime, in the unlikely scenario that it is we will have to wait at least 6 months for any supporting evidence, and this is gaining traction with SciFi hopefuls because it is being discussed by authoritative figures (NASA employees on this forum). Personally, I'm awaiting an unequivocal "Chicago Pile" moment, instead of near misses and uncertain results. , in the unlikely scenario that it is we will have to wait at least 6 months for any supporting evidence, and this is gaining traction with SciFi hopefuls because it is being discussed by authoritative figures (NASA employees on this forum). long-term R&D work is like an out-of-the-money call option: the probability of success is small and conversely, the payoff is huge. Regarding timing, it also works like an out-of-the-money call option: by the time you'll hear "an unequivocal yes, it is a success" you will be among the last to know. This applies to R&D on biotech drugs, R&D on Defense projects, R&D on high-tech, etc. So resign yourself to the truth: nobody will-ring a bell letting you know about the "pile moment" (certainly this was not done in WWII for the Chicago pile, we didn't announce to the enemy that we had launched onto the first steps leading to the A-Bomb). ==> the tests at NASA Eagleworks are the first steps in a long-term R&D project. Nobody ever though that this was a project where we were going to put these EM Drives into a spaceship next week and into a warp-drive next month. ==> this is well understood in Wall Street and in Main Street. We didn't announce during WWII that the Chicago Pile success had launched us onto the first steps leading to the A-Bomb. Biotech companies announce success in a biotech drug only after it has passed Phase 3 tests and approval from the FDA, by that time you are the last one to know. Ditto in High Tech R&D projects. Some might say it's a bit late in the day for people to be putting forward the line that there is nothing to see here please move along now. But that's going OT again. Bit late in the day for people to be putting forward the line that there is nothing to see here please move along now. Who put "forward the line that there is nothing to see here please move along " ? I meant in the sense that it's a bit late in the day to be attempting to cool expectations as regards warp drives at this time, as mention of such has already attracted the attention of the wider realm. I meant it's a bit late in the day to be attempting to cool expectations as regards warp drives even if unfounded in reality as mention of such has already attracted the attention of the wider realm. Read again. Who said "unfounded in reality " ? I don't see what is wrong in taking this cautious stance at this time in the process of research. But I have modified my wording in this post in light of your comments to better reflect the point that I was trying to put across. There is nothing wrong with regular people getting excited by this. Just as there is nothing wrong with non jurors and so forth forming an opinion on a court case. research that stirs the public imagination is good for science itself and the budgets thereof. There is nothing wrong with regular people getting excited by this. as opposed to what? Are we all NASA engineers or PHDs? In fact, non PhDs, get off! "Dr Koothrappali, Dr Hofstadter, Dr Cooper, MISTER Wolowitz"
"I have a Masters Degree"
I guess I count myself among the "regular" people... well, space enthusiast? NASA developed a war-drive accidentally ? was that an intended pun because of the possibility of destroying a small civilization just by turning off the warp field while pointing the ship at the planet? and i wanted to credit notsureof it on the optical diametric drive articles but did not find his post when briefly looking for it. so i knew it was either he or Mulletronn that posted it. Another surprise is that the discovery was accidental, as this comment attests. "Seems to have been an accidental connection. They were wondering where this “thrust” might be coming from. One scientists proposed that maybe it’s a warp of the spacetime foam, which is causing the thrust." I am really thinking if we have a warped space field in the vicinity of the cavity that a very accurate clock would be a good choice of measuring it. I am guessing a clock can measure a small change but it would accumulate over time where as I don't see the laser measurement accumulating over time. On the other hand it might be hard to stick the clock inside the cavity but maybe it doesn't have to be inside and just near by. As an uneducated nitwit who studies math and physics for sport, I am deeply frustrated by the idea that people without specialized training should be excited by anything which isn't in a textbook. Please be assured that @Stormbringer didn't mean anything of the kind. I have seen most of @Stormbringer's posts: a most considerate, polite, respectful, helpful and professional poster. The written word, particularly when typing fast, some times can convey extra meanings completely unintended by the person who wrote them in good faith. The comment by @AcesHigh was intented for comic release, as you can see from his grin , conveying humor. Yes. I only meant that people not accustomed to the academic rigor, experimental and peer reviews protocol nor educated in the physics or the math can get excited by this sort of thing and that's good, in my opinion. Not that credentialed professional people were not normal people. Perhaps I should have said something like "laypeople" though that doesn't sound appropriate. And as dense as I can be; I hadn't even noticed that anyone had been offended. I thought the replies were all in humor. I think that many underestimate the lengthy process that is R&D. It is often confused with prototyping, and thus the expectations are off. I for one am very thankful for showing the R&D process so openly and sharing the approach of how to possibly find a workable solution to a mindblowing prospect. Whatever comes out of it - knowledge and understanding will improve. I think that scientists should only follow the data and not be mindlessly bound by preconclusions of the past. If Max Planck had listened to his professor (he said something akin to "Why do you want to study physics? Except for some little things, everything that could be researched, was already researched. "), when he wanted to study physics, he wouldn't have studied physics. Let's think about the consequences for a bit.. . So, guys.. please continue to share the R&D process so openly as you have done.